During the crisis these indicators showed the stress in the credit markets and it is probably worth revisiting them now. This graph from Bloomberg, based on data from the British Bankers' Association, shows the three-month U.S. dollar London interbank offered rate, or Libor rose to 0.50% on Friday. This is an important rates since trillions of financial products worldwide are tied to the Libor - including many adjustable mortgages in the U.S. 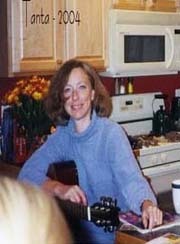 The rate has increased recently, but it is still very low. The TED spread has also risen recently and is now at 34.47. This is a 5 year graph to show the recent increase is very small compared to the huge increases during the worst of the crisis. Note: This is the difference between the interbank rate for three month loans and the three month Treasury. The peak was 463 on Oct 10th and a normal spread is below 50 bps. Here is the A2P2 spread from the Federal Reserve. This is the spread between high and low quality 30 day nonfinancial commercial paper. This has increased recently to 0.19, but the spread is still very low. 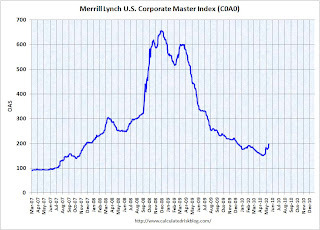 The last graph shows the Merrill Lynch Corporate Master Index OAS (Option adjusted spread) for the last few years. The Merrill Lynch US Corporate Index tracks the performance of US dollar denominated investment grade corporate debt publicly issued in the US domestic market. This index has increased lately - but it still very low compared to the worst of the crisis. So far we've only seen slightly wider credit spreads and just a hint of stress.